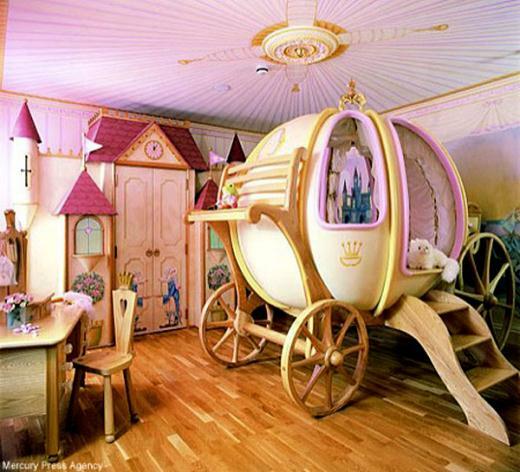 Fun, creative, and with plenty imagination, these insanely awesome bedrooms are the stuff that kids dreams are made of – and probably some adults, too! I certainly wouldn’t mind hanging out in some of these amazing spaces. Click “Next” to read more. This bedroom scores big points with kids and kids at heart! 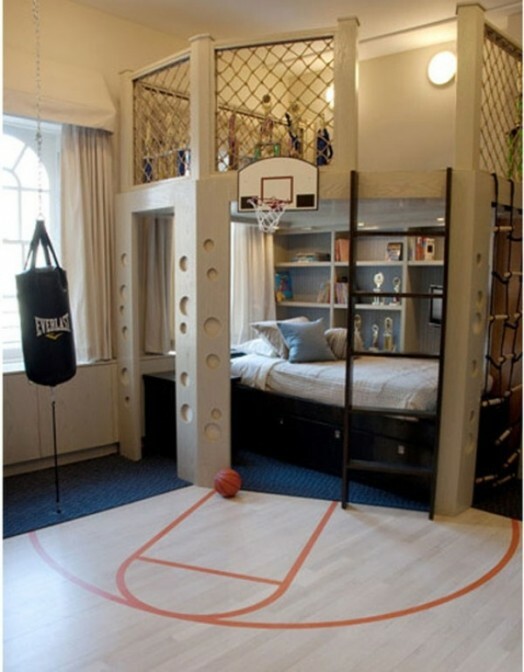 From the basketball net, and play area, to the rope ladder and trophy display, this room has everything a budding superstar needs to stay at the top of their game! Imaging getting to sleep inside your very own castle?! 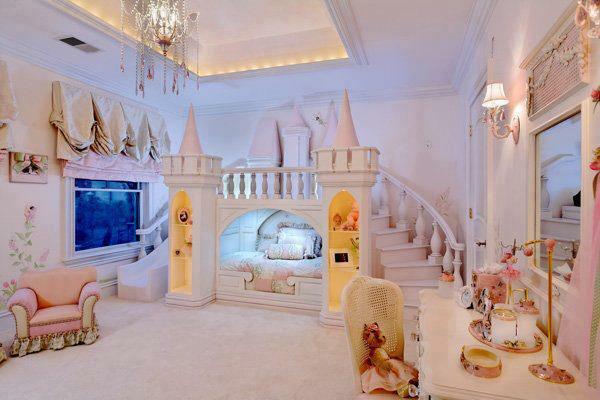 This bedroom is perfect for that Prince or Princess who loves fairy tales and slaying dragons. Plus, it’s practical too. The towers have their own shelves for storage, while the top of the castle makes for the perfect play area. 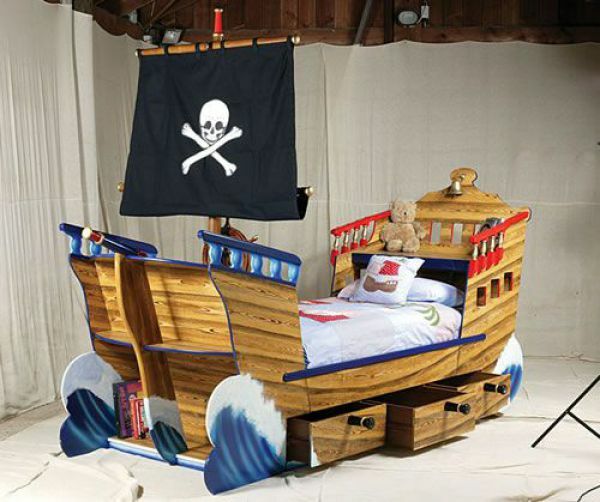 For kids with a sense of adventure, this pirate ship bed is the perfect place to spend the night dreaming of finding hidden treasure. With storage underneath, and at the front of the ship, this bed will also be a winner with parents, too. This room’s design is simple enough that it could be recreated fairly easily, but cool enough that your kid will have the best room on the block. I like that this bed is high enough off the ground that there’s a place to play underneath, but low enough that you won’t worry too much about falling. As for your little one, they’ll love that they get to start each morning with a slide! 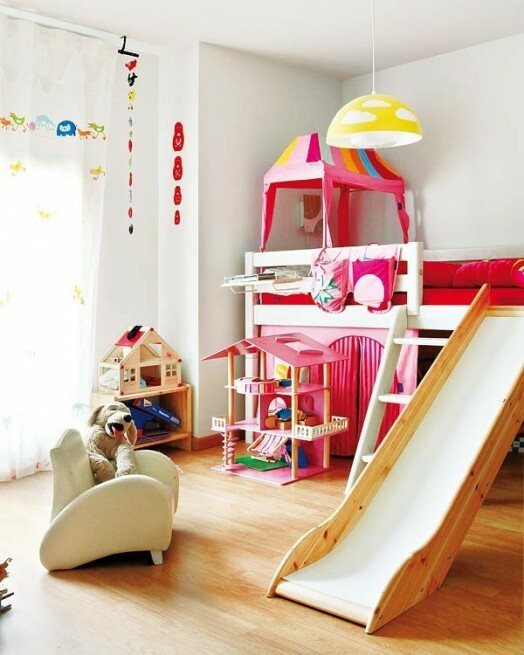 It’s no secret that kids love having a space to call their own. 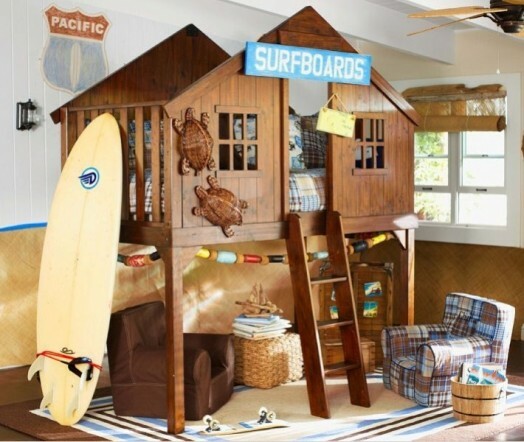 And what if that space was this awesome beach-house-turned-bed?! 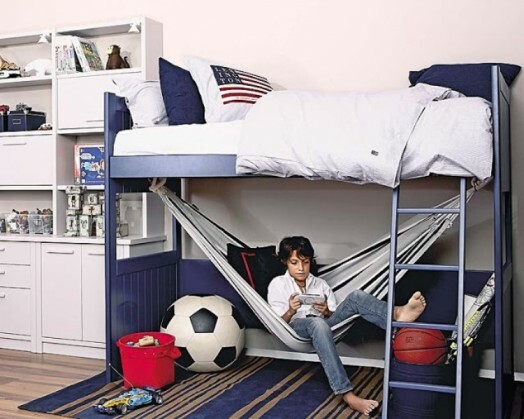 Stunning, cool, and probably the ultimate bunk bed, you won’t need a ton of space to incorporate this design into your kid’s room. Do you know what happened to Cinderella’s carriage after she married her Prince? Apparently it found its way to one lucky kid’s bedroom! We love that these parents stuck with the theme and also transformed the closet area into a castle. A bedroom isn’t just a place to sleep, it’s a place to relax, think, or read when you need some time for yourself. That goes for kids’ rooms too, and this stylish space certainly checks all of those boxes. I mean, who wouldn’t want to have the chance to relax in their very own hammock every day?! 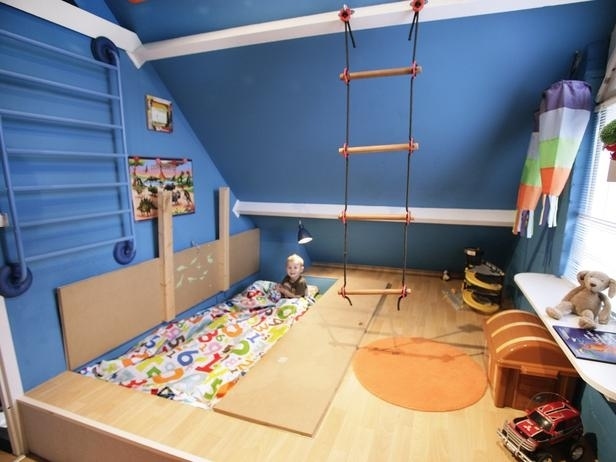 This awesome bedroom takes the things kids love most about a tree house, and brings them indoors! With its climbing rope, trap door, and treasure chest, your little one would certainly appreciate hanging out in this hideaway year-round. Swings are a playground favorite, and their addition to a bedroom would definitely help to make that space the coolest around! With proper support, it’s possible to bring this childhood staple into your kid’s room. Coupled with a day bed, this room is not just a place to sleep, but to hang out with friends, too. 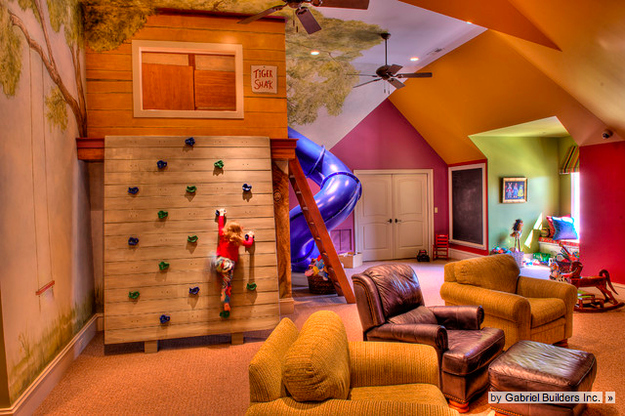 This room has everything: a rock climbing wall; a slide; a “kids only” hideout. Once they’re all tuckered out from playing in their awesome bedroom, the kids only have to walk a few steps to crawl into bed and get some sleep.